NETGEAR delivers wirespeed Gigabit performance and a full set of Layer 2 management features, as well as static routing with unsurpassed affordability. 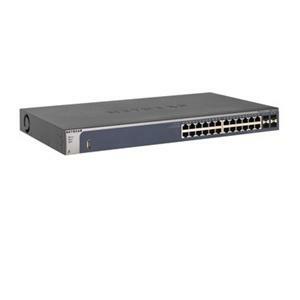 This high-speed switch delivers maximum throughput where you need it - to high-performance workgroups at the edge of the network, or as a backbone for Fast Ethernet switches and high-speed servers in demanding small networks. The non-blocking design offers full Gigabit throughput simultaneously to all 24 10/100/1000 ports to ensure reliable performance. Flexible fiber connectivity is enabled through four combination small form-factor pluggable (SFP) Gigabit interfaces. Layer 2 management functionality delivers reliability, control, and availability. Flow control, layer 2 switching, auto-negotiation, BOOTP support, ARP support, trunking, VLAN support, auto-uplink (auto MDI/MDI-X), IGMP snooping, Syslog support, DoS attack prevention, port mirroring, DiffServ support, manageable, Weighted Round Robin (WRR) queuing, store and forward, MAC address filtering, Broadcast Storm Control, Multicast Storm Control, Unicast Storm Control, firmware upgradable, SNTP support, Rapid Spanning Tree Protocol (RSTP) support, DHCP snooping, Trivial File Transfer Protocol (TFTP) support, Access Control List (ACL) support, Quality of Service (QoS), Jumbo Frames support, DHCP server, MLD snooping, Dynamic ARP Inspection (DAI).